Contains the ingredient N,N-Dimethylglycine which helps transport oxygen to break down glycogens, fueling ATP cycle and creating energy in the body. Vita Flex® DMG delivers a minimum of 1,500 mg DMG HCl per ounce. DMG is a natural metabolic enhancer favored by trainers and athletes. N,N-Dimethylglycine helps transport oxygen to break down glycogen, fueling the ATP cycle and creating energy in the body. 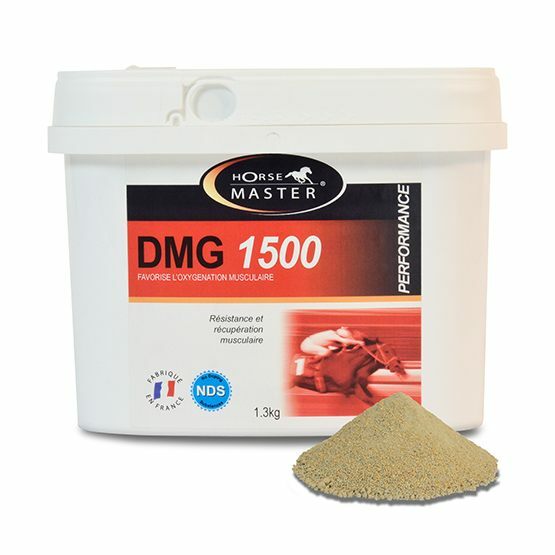 DMG is a water-soluble ingredient and is readily absorbed. Vita Flex DMG is a premium quality, affordable source of dimethylglycine hydrochloride for horses. Give 1/2 scoop (750 mg DMG HCl) twice daily.Give 1 to 1 1/2 scoops twice daily beginning 2 to 3 days before and during performance, or as directed by veterinarian. Increase supplementation of large breeds proportionately according to body weight in excess of 1,000 pounds.Severely stressed horses may benefit from additional amounts.Keep cool and dry.Reseal after each use.